Journey into healing for benefit. Ehwaz is the half-month stave through 14 April. Berkana is the intuitive stave, and Fehu indicates the rune’s message to us. Read right to left is Ehwaz, Berkana, then Fehu. Receive the ad-free, full weekly runecast by subscribing through Patreon. 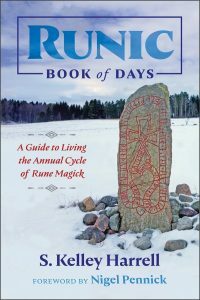 There, find more detail on how the current runes impact human life force over the next week, and how to best manage the curves and twists therein. With a paid subscription, also receive TWR on Sunday instead of Monday, for as little as $5 a month, or for more engagement with me, such as regular Soul Readings, Sabbat Runecasts, and personal runecasts, choose one of the higher subscription levels. Check out my What in the Wyrd podcast, which is available across all popular podcast platforms, including Google Play and iTunes. This week’s cast carries a bit more relief than the last couple of weeks. We greeted Ostara with Berkana, the balm of the Elder Futhark. It brings this quiet place of sitting with accomplishment and healing from ordeal–very much the recovery period for something birthed. So very curious that Berkana remains with us this week in a supportive position of Ehwaz. As the rune of the season, Ehwaz tells us we have to go deeper. 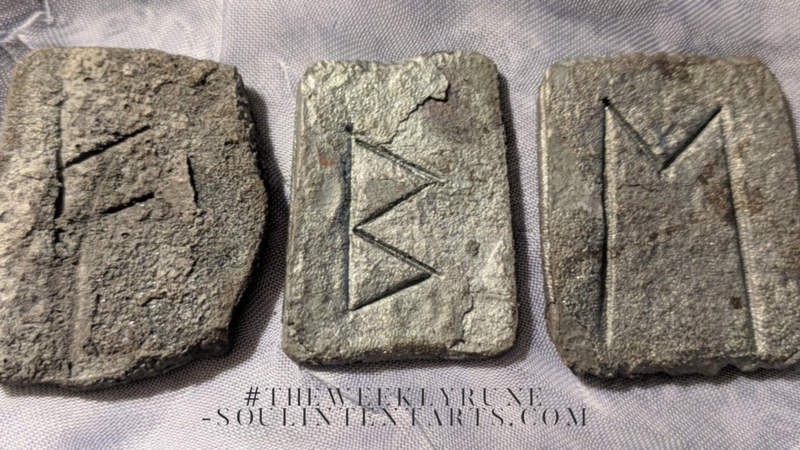 Because it’s surrounded by Berkana–last week and as the supportive rune this week–that depth is related to some healing we are now undertaking. Ehwaz is the rune of the shamanic trance state that forces us front-and-center on the spirit of things. There is nothing superficial about Ehwaz, and for that reason it’s considered a connection point for animism. We know there is an Unseen world that exists alongside the Seen. Anytime Ehwaz comes up is a call to be the bridge between them. This week, examine what is speaking beyond the surface. Invite it to speak its needs to you. Listen, and respond. In this way Ehwaz will address something very specific and needed. In this native time of the rune, though, work with it to instill this experience of being all year. Examine your animistic roots, the ones you could travel through Ancestors, the ones indigenous to the planet and beyond, and make it part of a personal practice to hold this view and engage it, all year. With the supporting rune we’ve broken away from the repetition of Mannaz reversed, which again is curious, as in the natural order of the Elder Futhark, it follows Ehwaz. It will be the next half-month rune. Let’s take this reprieve from social onslaught to regroup, catch our breath, and seriously consider what healing we’re being asked to take deeper. Maybe it’s appropriate to ask the spirit of that healing to come for a chat. Maybe the closure brought by Berkana over the last two weeks has something else to speak before it can truly go. Whatever it is, know that the ability to meet it in this intimate way is to the personal benefit. It’s not only the way for it to release, but to truly feel soothed. Fehu is the pay off of this effort. From the voice of the runes, themselves, the advice here is to realize we’ve all tended the place we’re in, to arrive at standing exactly where we are. It’s not an accident. It’s not punishment or a total surprise. We get where we are because we’re overseeing it, or we’re not–which is a form of passive tending. We can’t control all of the elements, though it’s our duty to manage the ones we can. Fehu is that reminder, and the act of. So do take time to explore all the needed angles of healing, where it needs to be taken deeper, with an eye toward it paying off. Berkana indicates it will truly soothe what’s been an irritant, though Fehu indicates it manifesting in the resources around us. It’s not just the satisfaction of the job done or some good feeling. It will actually show up in our lives with some form of payoff for work done. How do you engage the Unseen of your life? How do you confront ordeal? How do you acknowledge pay off for your efforts? In case you missed it–I was a panelist on the Runes Round Table last week, on Blog Talk Radio. 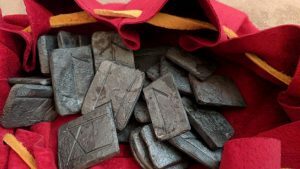 It was a great discussion with several seasoned runesters, who work with different futharks, and brought different uses of the runes to the table. I learned a great deal from it, and I think you will enjoy it, too. Ask about studying the runes with me.